High frequency facial benefits range from treating enlarged pores, and fine lines and wrinkles, and puffy eyes, and dark circles under the eyes, and to increase the collagen and elastin production and toning the skin. It's purpose is to eliminate toxins and acne problems and the acne-causing bacteria. It's also used to improve blood circulation and lymphatic drainage, cellulite and thinning hair. It helps with the absorption and penetration of skin care products by gently warming the skin tissues, because the primary action of high frequency current is producing thermal heat. All machines use a high frequency glass electrode which come in various shapes and sizes to treat different parts of the face and body, and when it touches the skin, a mild electrical current passes through the neon or argon gas filled glass electrode and causes it to produce a subtle glow and buzzing noise. The electrodes produce either a neon red/orange light or violet/blue light depending on the gas they are filled with. Nowadays acne prone skin and aging skin can both be treated with violet or red light therapy so the skin feels energized, and firmer and refreshed, and softer and rosy immediately after one treatment! 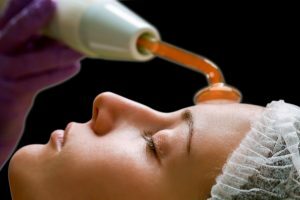 High frequency has been proven to be effective on almost any skin lesion, and acne marks treatment and burns, and on cold sores because it helps to heal and restore the skin quickly, and high frequency facials are considered a safe and gentle facial therapy approach to skin rejuvenation. We incorporate high frequency into our facial.